When it comes to your child, you’re the expert. So if you have even the slightest inkling that your son or daughter is struggling in school, remember, he or she doesn’t have to. The fact is, when children experience learning difficulties, there’s always an underlying reason preventing the “just as bright” child from succeeding in school. But the key is acting now to find the cause, and learn what you can do to help your child succeed. 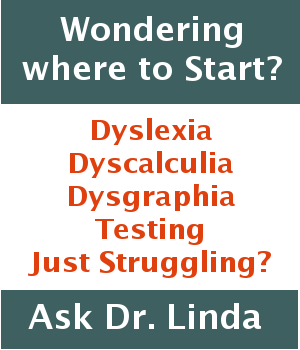 That’s what this blog is all about: giving you strategies to help your child succeed in school. We hope you’ll get involved. Look around. And please, comment. Let’s get the conversation started. Tell us your greatest parenting challenge. Maybe it’s a nightly struggle around homework. Could be he just doesn’t get math. Perhaps she’s very bright but doesn’t work up to her potential. Let us know in the comment section below. One of my kids just never worked up to her potential and even dropped out of high school. Almost seems like it’s a genetic thing since now her daughter isn’t working up to her potential either. As a grandmother, I sure wish I could do something to help this granddaughter. A great thing to do with your granddaughter is to share your experiences with her. Tell her about the obstacles you had to overcome when you were in school. You’ll be surprised how many stragegies she’ll pick up from your stories. And, maybe between you and your granddaughter, her mom may have a renewed interest in learning.